Reference images from somewhere on the internet so others can see them. E.g. on your website. 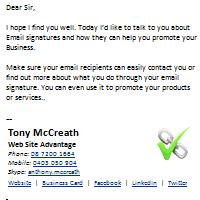 It's best to use a branded email address if possible. E.g. use your websites domains based email account over your ISP (@bigpond.com.au) or web (@hotmail.com) addresses. It's more professional and invokes trust. I have several signatures for different uses. E.g. personal, business, replies, promotions. Make your signatures suite the moment. My reply signature is shorter than my main signature so I don't clog up long conversations with long signatures.